Beds are for resting. But who can rest if they are not comfortable? The Invacare SB 755 Bed is designed to combine comfort, ease of handling and safety. Ideal for community care environments, it is also perfect for domestic, in-home use as well. This bed offers ideal seating positioning, to reduce shear and friction. It is adjustable to meet individual user requirements. And thanks to a unique, integrated feature, the bed can be adapted to taller users. Both the head and foot of the bed can be extended. This translates into real benefits for both users and carers. 5 Why Does It Matter? Beds need to be adjustable, and equally as comfortable when you are sitting up as lying down. That’s why the SB 755 comes with several features to ensure an excellent seating position. The SB 755 reduces shear and friction during movement by improved auto-regression, optimised length of mattress platform sections, and a leg section that can be lowered below horizontal. Also, taller users will appreciate the option of a length extension of 100 mm at both the head and foot of the bed. Beds can be heavy and cumbersome to move. But the SB 755 offers great ease of handling. No part of the bed weighs more than 25 kg. Dismantling the bed has been made simple, to allow for greater ease of transport and storage. The bed can be packed up on its base and rolled directly from the vehicle it was transported in, straight to the bedroom. It only requires one person to transport the SB 755, and assembly can be carried out quickly and with minimum effort. Bed parts, mattress, and accessories are stored directly on the base with special hooks. This makes transport a breeze. Safety is a top priority at Invacare. 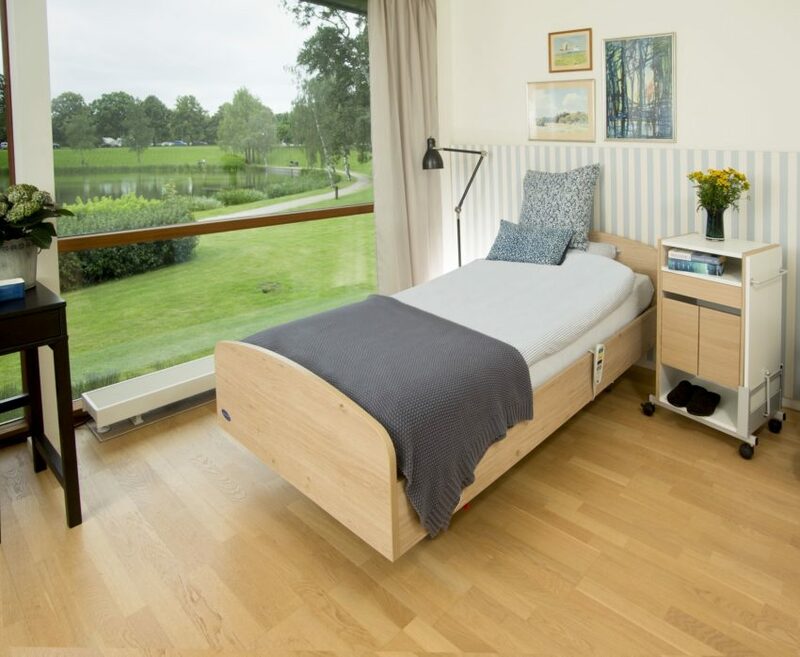 This is done in both the standard bed length as well as the extendable version, without compromising the ergonomics or working conditions of the carers. One option on the SB 755 is different styles of bed ends. This gives the user some ability to personalize the look of the bed and match it to their home. Wooden side panels can be used in conjunction with the side rails if desired. Also, if you want to access the foot or the head of the bed easily, the bed end panels are removable, even when the full-length side rails are mounted. Other features include: the addition of hand controls, a lifting pole, swivel support handle, steel mattress supports, a foldable steel rail for higher mattresses, a central brake, and a lowering kit that uses castor wheels to lower the bed by 250 mm. The SB 755 can also be ordered in a wide version, for plus sized people. The wide version comes in two different sizes and can hold up to 200 kg. Why does it matter to have all of these special features? 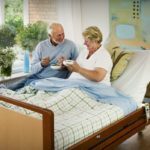 When you are spending the majority of your time in a bed, whether from permanent disability, surgical restrictions, or fragile health, you want it to be as comfortable as possible. Comfort comes first when you are trying to sleep at night and when you are experiencing life during the day from your bedside. Comfort allows you to rest and recover, and being comfortable also means you aren’t sustaining any new injuries, such as skin breakdown. Comfort allows you to stop thinking about how your body feels and frees you to interact with and enjoy the world around you. The Invacare SB 755 has made comfort as high a priority as safety because your comfort is our focus.